They appreciate unique angles, bursts of inspiration, and the proverbial lightbulb-over-the-head. They look to creatives to help brands tell an effective story that motivates people to take action. We are part of marketing strategies that inspire behavior change. Yet, that creativity doesn’t just come from “the creatives” and not just on the agency side. Not at all. Everyone has ideas. You have ideas. On the side, I am a professional comic book writer. My early career started in journalism and then evolved into writing and publishing comic books. These experiences trying to tell visual stories on a printed page were great experience for trying to tell visual stories on a web page. Over the years, I’ve come to understand that all marketers are visual storytellers trying to tell stories on a deadline. At comic book conventions, fans and aspiring creators would sometimes ask where I got my ideas. If you’ve ever sat at a table and watched a parade of people come to your table to ask the same question, you start to challenge yourself to come up with unique and entertaining answers. This is partially to entertain myself, partially to entertain them, and mainly because I don’t have a really good answer. There are a few creators out there who have come up with funny, snarky, and downright ridiculous versions of the same answer. According to many sources, famed writer Harlan Ellison gets his ideas in Poughkeepsie. A good friend and occasional collaborator Darick Robertson once told me his theory of creativity. He may have heard a variation of this, but he customized it for me. And I will pass it along to you with my little spin. Darick suggested that there is an Idea Etherverse that floats just above our consciousness. 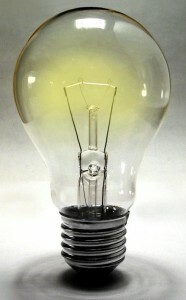 It’s there all the time and different creative ideas drift past laconically just waiting to be taken down and nurtured. These ideas are as ethereal as ghosts, until you build something around them. They are free for the taking. Everyone has access to the same Idea Etherverse, so if you let the idea pass you buy, it will float past the next person. That’s why so many people say things like, “I had that same idea!” If there is an Idea Etherverse, then yes, they may have had the same idea. They probably just didn’t take the idea down and nurture it. So it floated away, back to The Idea Etherverse. Did that lightbulb in your head just go on? Maybe it’s coming from the Idea Etherverse. I really like this Idea Etherverse concept because it places responsibility on the person who has an idea. For example, you. Creative services people are more in tune with the Idea Etherverse, even if they don’t call it that. Their antenna is extended, ready to receive the ideas floating around. Because of their role in the workplace (especially in advertising and marketing agencies), they have the confidence to explore and express their ideas. It is very easy for a content strategist or copywriter to turn to another person in creative services and bounce around an idea. It may be something completely kooky, but usually a fellow creative understands that ideas are fragile and require some nurturing. There may not be a direct, sellable solution, but they will usually play through the scenario of “what if we tried this new idea…?” This is very liberating and often results in new paths and ideas. Culturally, we give creatives a lot of latitude for expression. They are allowed to chase ideas that never make it to the page. It’s part of the creative process. But why limit this type of mental exploration to one group of people in the workplace? Interestingly enough, I’ve found that the senior team leaders are the most receptive to ideas from unexpected places, since they just want good ideas. In fact, you might be surprised at how receptive they are to enthusiasm and creativity from every member of their organization. We are all creative and we all have access to the Idea Etherverse. Anyone can pull down an idea, shape it for their team, and help drive innovation and creativity. The first step is yours, so move forward in a relevant and appropriate way. 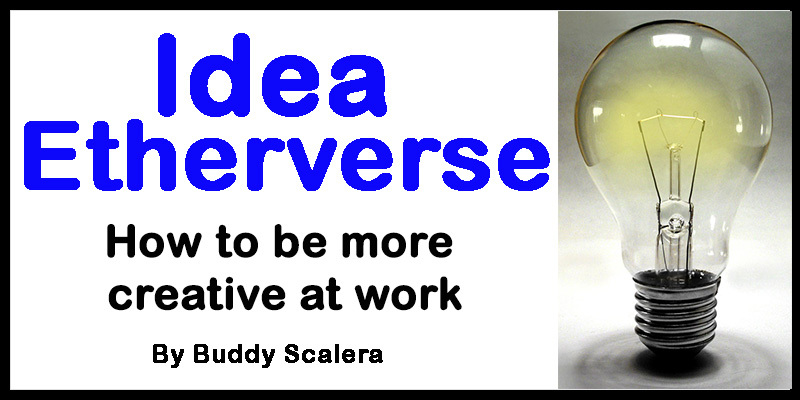 If you feel an idea floating above you in the Idea Etherverse, gently pull it down and make it yours. You may need to nurture it for a day or three. Personally, I find that a new idea is better when you’ve had a chance to sleep on it. As part of my ongoing creative process, I like to save interesting articles. There are a lot of useful tools for storing articles and ideas that you find online. I use a combination of Google Keep and Microsoft OneNote to save interesting articles, photos, and action items. These are free tools that work on both Mac and PC. After that, sketch out a few ideas in whatever medium works best for you. I like PowerPoint because it gives me the flexibility to mock up shapes and text in a rapid prototype. This is an important step because you should save the details while they are fresh in your head. Plus, almost everyone at work will have PowerPoint on their computer. Not all of your new ideas will be good, nor will all of them be bad. By sharing them, you will develop your creative muscles, so that you know how to nurture your new ideas. It takes practice to learn how to effectively pluck something from the Idea Etherverse and turn it into something. So don’t give up too easily, especially in the face of early flops. Here’s a secret you may not know. Those of us who start careers in creative services are taught to deal with rejection. You will present 5 ideas and at least 4 of them will be rejected by necessity. In the real world, brands usually have to settle on one big idea. If your idea isn’t the one chosen, then you can still be creative by contributing to the actual idea that drives the campaign. Being a creative means finding ways to contribute, even after you’ve been rejected. Rejection is part of the job. Sometimes you simply need to defend your creative ideas. Other times, you just have to be willing to move on to the next idea. Being creative is a state of mind. Not only is creativity needed in the workplace, it is often rewarded in many ways. So pull down an idea, sleep on it a few nights, and start collaborating with a friend. We are all creative in our own ways. Find a way to share your ideas. And if you happen to be in New Jersey and want to share your ideas with me…? I like spicy, crunchy tuna rolls, and would love to hear your ideas over sushi. This entry was posted in advertising, content strategy, creativity, fun stuff, Idea Etherverse, Ideas and tagged careers, creative, creativity, etherverse, idea etherverse, ideas, work by Buddy_Scalera. Bookmark the permalink.